Genus summary: Andrena ( /an-DREE-nuh/) is a large, well known genus that occurs in the Americas, Eurasia and the Old World Tropics with over 1300 species. In California, there are approximately 261 species. This may be the genus with the most species in all of California. Diagnostic characters: Andrena are small to medium sized bees that range in size from 0.3 to 0.7 inches (7 to 18 mm) in length. 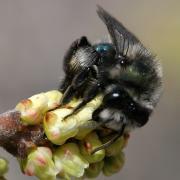 They are hairy bees that are black or dull metallic blue or green. Most species are moderately hairy and have pale bands of hair on their abdomen and the abdomen is long relative to other bee groups. Females have wide, facial foveae (depressions) lined with white to brown hairs that make them seem velvety and large scopa (brushes of hairs for holding pollen) on the upper part of their leg, seemingly in their “armpits”. Under a microscope, you can see that males have two subantennal sutures and a straight basal vein in the fore wing. In addition, the marginal cell is pointed and rests on the margin of wing. Most Andrena have 3 submarginal cells in the fore wing. Andrena have a variety of striking colorations but species are difficult to tell apart from each other. 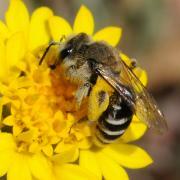 Similar species: Some Halictus appear similar to Andrena. The Andrena can easily be differentiated by their facial foveae. Food resources. The genus contains both generalist and specialist species. Some plant taxa, such as the evening primroses, (Oenothera), are highly dependent on Andrena for pollination. 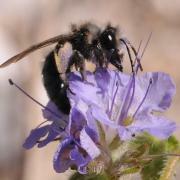 Andrena chalybaea, one of our native California species is considered to be monolectic, meaning it generally only collects pollen from one species, Cammissonia ovata. This is an unusual degree of specialization. Nests: Most Andrena are solitary nesters, and they often nest in large aggregations. A few species nest communally, where two or more females share a nest but build and provision their own nest cells. All Andrena nest in the ground; they often prefer sandy soil near or under shrubs. Brood cells are lined with a waxy material secreted by the female. Flight season: These bees fly in the early spring. Some species emerge as early as March or April.